I fly into Zurich and take the train to Lugano, a route only made possible when the Gotthard Tunnel opened in 1882. There’s now a new tunnel, the 2016 Gotthard Base, which shaves 30 minutes off the journey time, reaching Lugano in just over two hours. It was a Dutchman, Willem Jan Holsboer, who first proposed a railway line from Landquart to Davos in 1888. His wife was hospitalised in a Sanatorium and he grew tired of journeying by horse and cart. In 1895, Holsboer changed his company’s name to the Rhaetian Railway and started expanding. The Bernina Line was finally completed in 1910 and links St Moritz to Tirano in Italy, crossing the Bernina pass at 2,253m. Sitting on the shores of the beautiful lake the town became established as a resort in the 19th century when railway tourists started arriving. There’s even a section called Paradiso, popular with the Brits, which has a funicular up to the top of Monte San Salvatore with its glorious views. 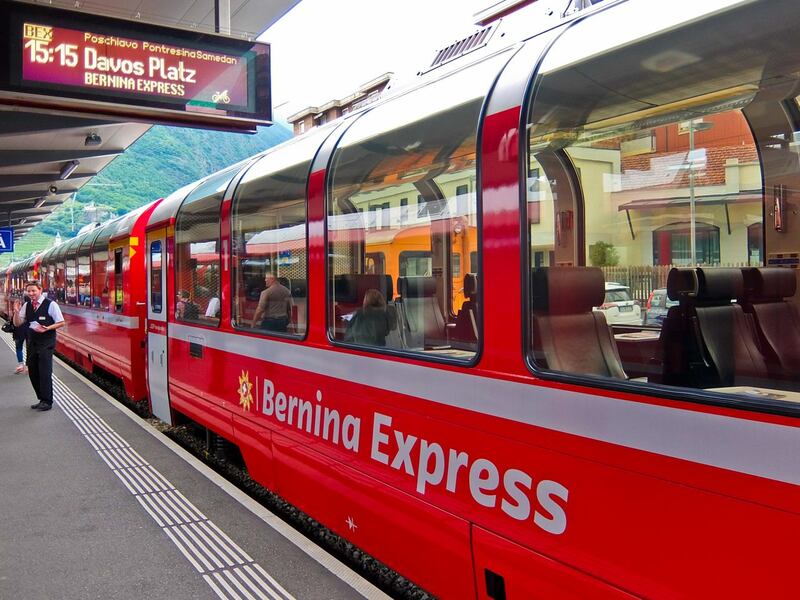 There’s no time to linger as I have to catch the Bernina Express. It starts in Tirano, 130km to the east, but unfortunately there’s no direct rail connection from Lugano. 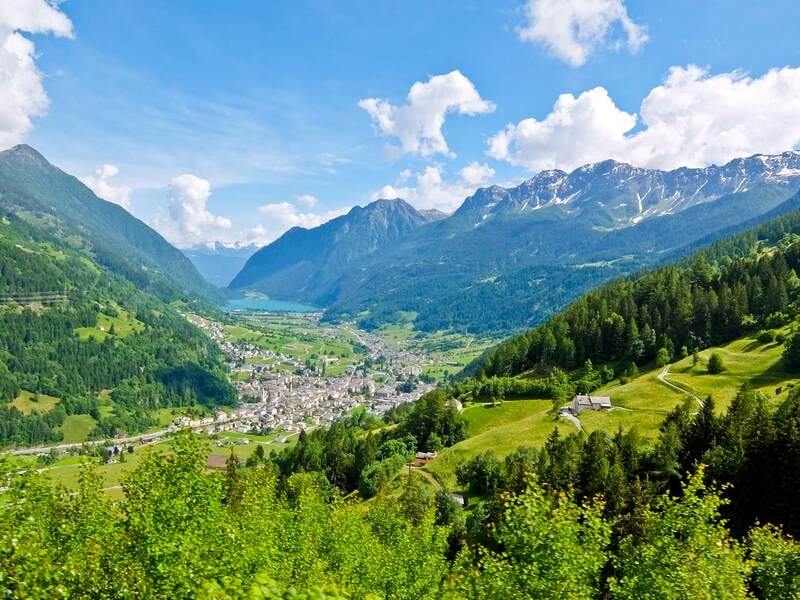 Instead I take the special Bernina Express Bus into Italy, past scenic Lake Como, and into the Valtelinna Valley, lined with orchards, chestnut trees and vineyards before arriving at the station. I just have enough time to enjoy an excellent Italian lunch before boarding the train. The huge panoramic windows give me a good view of the Valposchiavo as the train climbs, following the centuries old route which brought wine to the tables of Graubünden and Vorarlberg. The first landmark is the Brusio spiral viaduct, probably the most spectacular construction on the Bernina Line, opened in 1908. Its nine stone arches support a single track which curves 360 degrees to limit the gradient to just 7%. Anything higher than that then the train would slip on the way up or become uncontrollable on the way down. As we reach Lago di Poschiavo, I get off at La Prese to take a boat trip to explore the lake. The Sassalbo is 100 years old and was brought here from the River Aare in 2015 over the mountain passes. On board, they serve local sausage and cheese with a glass of Valtellina wine, as you sail pass fishermen trying to catch the abundant char and trout that populate the waters here. It’s possible to hire a rowing boat and join them. If you’re successful, then the hotel will clean and vacuum pack your fish, so you can take it home. One stop up the line, I spend the night in the town of Poschiavo which punches above its weight, full of large houses in the Venetian style built in 1860’s. 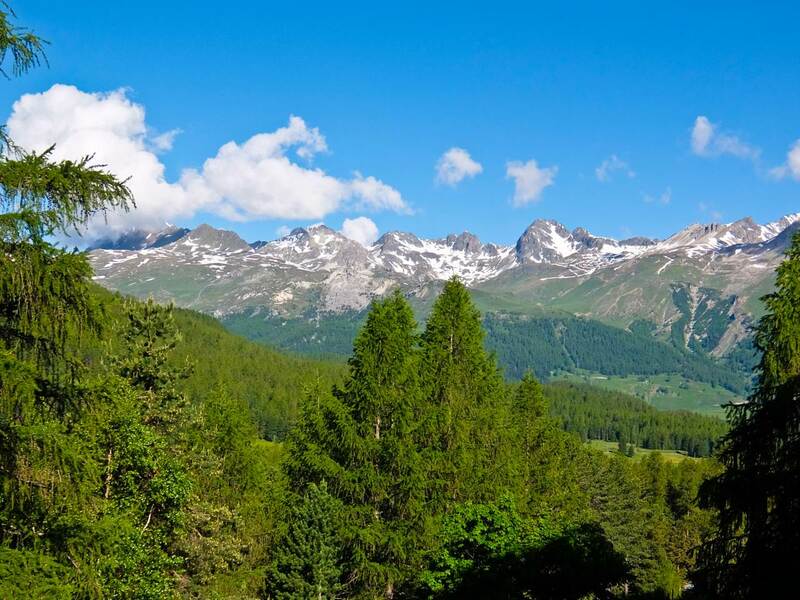 Its wealth derives from its position on the route crossing the Bernina Pass and the old coaching inn, the Hotel Albrici, still receives travellers in its lavished restored rooms. 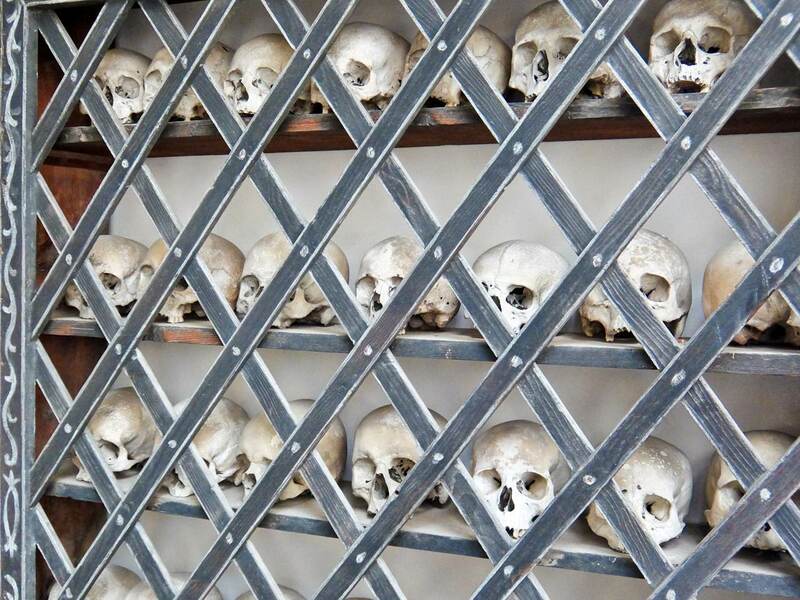 Opposite the church there’s a rather macabre display of skulls, collected from the catacombs underneath the church. Next day, I’m back on the train, this time in an open carriage at the back, allowing me to get the full benefit of the magnificent views, with the wind rippling through my hair. It’s noisy as the wheels squeal as they navigate the tight turns, but exhilarating. I stop for lunch at Alp Grüm, at 2,091m only accessible on foot or by rail. Below me is Lago Palü and in front is Piz Palü and its icy glacier, with the Bergamasker Alps in the distance. The restaurant has typical local Swiss dishes and you can stay the night here, enjoying the tranquillity once the trains have ceased. It’s now too cold to ride in the open so instead I take a classic Pullman carriage, restored in the art deco style of the early 20th century. The roomy armchairs, bay windows, and teak fittings add a fitting layer of luxury. 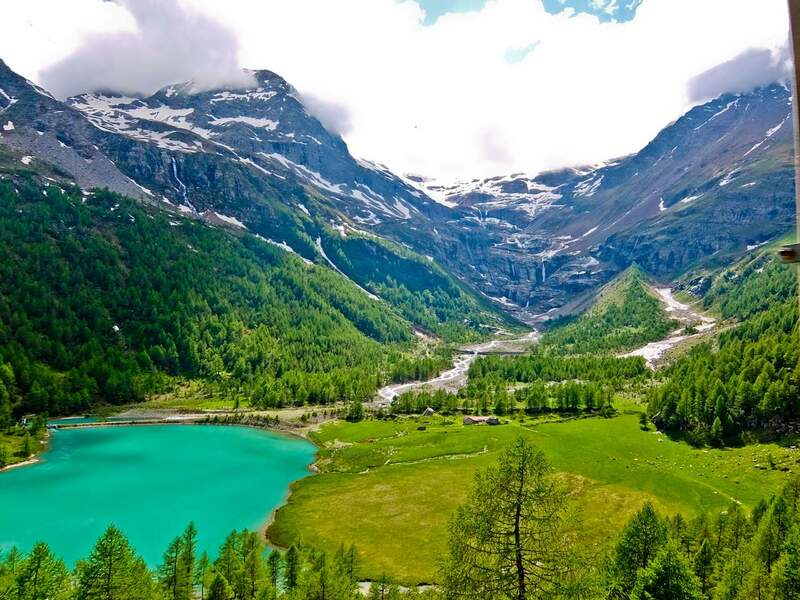 We pass alongside Lago Bianco, fed by glacier water, before reaching Ospizio Bernina, the summit at 2,253 metres. This is the watershed – to the south, the waters flow into the Adriatic and to the east, into the Black Sea. 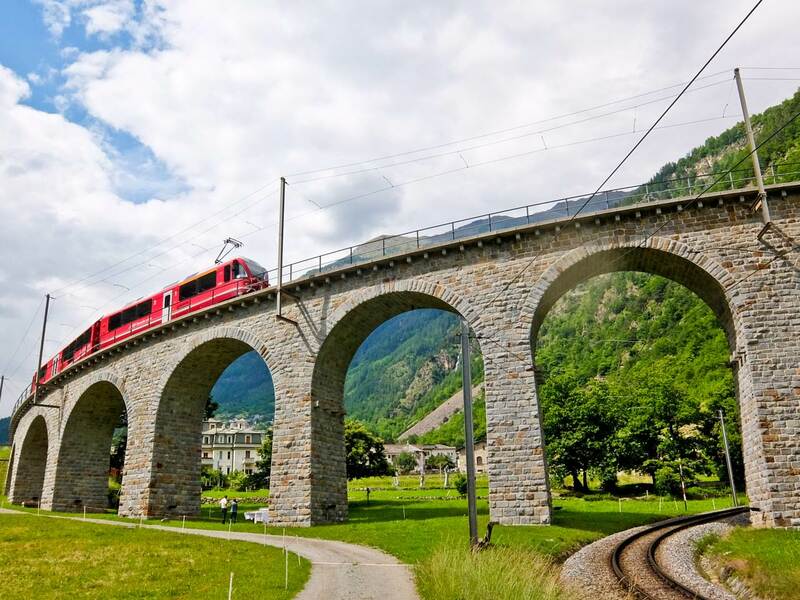 It’s now downhill all the way to Pontresina where I’m going to be spending the night in preparation for the festivities celebrating 10 years of the railway’s UNESCO World Heritage award. This is a day for nostalgia, a delight for railway buffs. At Pontresina station there’s a collection of vintage rolling stock and a working steam locomotive which pulls us for 15 minutes to the next station at Samedan. In fact the whole day is devoted to the age of steam and it’s back to modern times as I take the regular Bernina Express, crossing the spectacular Landwasser Viaduct, to Chur, then back to Zurich. Of course the festivities are unique but a few times a year, the Rhaetian Railway runs special photo safaris pulled by steam engines. It’s a train spotter’s dream.